Ageing is a very complex process that leads to various physiological changes due to multiple environmental and lifestyle changes. Initially it is harmless as our body is trained to tackle all these small damages, but it does not have the potential to handle these impacts for infinite period. 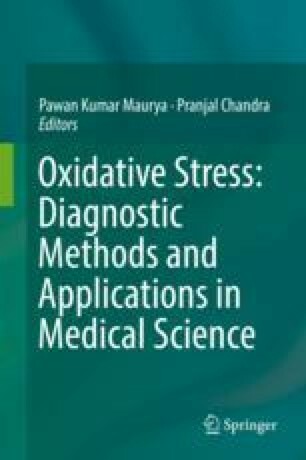 Oxidative stress and production of reactive oxygen species (ROS) and reactive nitrogen species (RNS) are the major reasons for various age-related disorders such as neurodegenerative disorders, types of cancers and diabetes (Collier et al. 1990; Boynes 1991). Oxidative stress plays a significant function in their pathogenesis, and this may bring about certain changes in the oxidative stress biomarkers such as malondialdehyde (MDA), superoxide dismutase (SOD), glutathione, etc. These biomarkers are excellent tool that can be used as an indicator to analyse the pathological or control conditions. Different biomarkers have varied characteristics according to disease state, disease trait and rate of the disease. As per global ageing index, approximately 22% of the total population will be 60+, i.e. 2031 million (http://www.helpage.org/global-agewatch/population-ageing-data/global-ageing-data/). This will have a huge impact on healthcare and needed infrastructure cost (http://www.nia.nih.gov/sites/default/files/global_health_and_aging.pdf). Corresponding author (MPR) is thankful to the Council of Scientific and Industrial Research, Human Resource Development Group, New Delhi (India), for financial support in the project grant [38 (1412) 16/EMR-II] that made this work possible.